ROGER ARONOFF: Next I want to call up Ken Timmerman. Ken Timmerman, author and investigative journalist. He’s a bestselling author, has spent more than three decades interviewing dissidents behind the Iron Curtain, covering numerous Middle East wars, interviewing suicide bombers, and debriefing defectors from Iranian intelligence organizations. During the latter half of the 1980s he covered the Iran-Iraq war, gaining firsthand knowledge of Iraq’s deadly weapons buildup. In 1995, he helped establish the Foundation for Democracy in Iran, which has become a rallying point for Iranian democrats seeking an end–that’s small “D” democrats–seeking an end to brutal clerical rule in Iran. His most recent work of non-fiction, Shadow Warriors: Traitors, Saboteurs, and the Party of Surrender, exposes a secret intelligence war fought not against our enemies abroad but by partisan bureaucrats and their allies in Congress and the media against a sitting U.S. president. Ladies and gentlemen, Ken Timmerman. TIMMERMAN: All right. But it was going to be U.S. Navy and French Navy. It was going to be U.S. Navy and French Navy. So we’re sitting there, and all of a sudden these fighter jets, we hear these fighter jets and kind of look out there, that’s kind of interesting. They’re certainly not the Lebanese air force. They’re never up in the air. Hmmm, could it be the U.S.? I kind of took a closer look, and I said, no, those are [speaks French], which are French fighter jets at that point. I said, what the hell are the French doing here? And guess what, they’re headed toward Baalbek. And of course, they were, and we learned later one when we got back that the French had struck the barracks, but in the inimitable way that the French at that point conducted war in the Middle East, there had been a leak from their Foreign Ministry to the Iranians, to Hezbollah, or the precursor, of Hezbollah, in Sheik Abdullah Barracks, and they had evacuated all of their guys from the barracks before the French hit–and all that they managed to do was to kill a shepherd and to blow up a piece of the barracks. That’s it. So, even at that part of the counterattack was foiled from the inside. I’m writing a book, as I mentioned earlier, on Benghazi, and I can tell you the deeper I get into this story the darker and the dirtier it gets. I think you’re right, colonel, that there is a crisis here with duty, honor, country, and it certainly, those standards have been lost at the political level by our political leadership. There’s no doubt about that. I would not hold out too much stake, though, for the press. I’d just like to remind you that, I’m sure all of you here remember the story of George Zimmerman down in Florida, the guy who’s been hounded by the media at the same time that we were trying to investigate Benghazi. Well, what he did, he got the media off his trail because he changed his name to “Ben Ghazi.” They never bothered him again. Look, this attack, this attack in Benghazi did not happen in a vacuum. This wasn’t something, it wasn’t a fluke. It didn’t just occur. It was a clear response, I believe, to two things. Number one, the perception in the Middle East which Admiral Lyons laid out, I think, pretty clearly that America was weak. We were weak, we would not respond. We had not responded in the past. We’d been hit in the past. We would not respond. There’s the perception that America is weak and when you are perceived as being weak in the Middle East, they hit you. That’s what they do. And the second thing was even more serious than that. It was a policy shift that took place as soon as Obama took power, to overturn our longstanding national security alliances in the Middle East, and to support the Muslim Brotherhood. Now this was a conscious decision taken by the White House, and I want to walk you through a little bit some of the steps of that decision because I think it’s important to do, and I will do this also in my book. One of the speakers earlier on mentioned Obama’s very important speech in Cairo in June of 2009, where he sort of laid out, laid the foundation for this shift to backing the Muslim Brotherhood and Islamist groups. And I remind you that as he was giving that speech, two very important things that people forget about it. First of all, he was in Cairo, Cairo University, and there was an important person who was not even invited–not just not there, but wasn’t even invited. That was President Mubarak, okay. So, the President of the United States, going to a foreign country, giving a major speech, and he does not even invite the President of the host country. And sitting behind the President of the United States as he’s giving this speech, so they’re pictured in all of the news footage of it, are top members of the Muslim Brotherhood–at that point still an outlawed group, although tolerated by the Mubarak regime. This terrible dictatorship, Hosni Mubarak, was tolerating his opposition and allowing them prime time footage in all of the TVs throughout Egypt. The President’s policy was tested just a couple weeks later. He was talking about winds of change coming through the Middle East. He was talking about being friends with Islam in– On the 12th of June 2009, so, less than ten days later, three million people take to the streets of Iran after a flawed election, probably a fraudulent election in Iran. And they hold up signs in English saying ‘Obama, are you with us?’ It was a direct, immediate call for United States political support. Not military support, but political support. And the president dithers. The president won’t comment. And when he finally does open his mouth a while later, he says ‘We have a bad history in the United States of getting involved in the domestic affairs of Iran,’ and so we’re not going to do that, we’re not going to get involved in their domestic affairs. And that essentially sounded the death knell to the protests in Iran which could have, I believe, at that point, seriously undermined, if not jeopardized, the stability of the regime. Fast-forward 18 months and there are protests that begin in Cairo against a long-standing United States ally, Hosni Mubarak. And what does Obama do? Immediately he sends Frank Wisner, a former Ambassador, who’s a personal friend of Mubarak, he sends him to Cairo to essentially make the case to Mubarak that he’s got to step down. So you have the Muslim Brotherhood demonstrating in Cairo trying to get rid of Mubarak and Obama is supporting them. Now, what do those two events have in common? Well, I would argue that besides the ineptitude of the Administration, they have in common the fact that U.S. actions propped up in the first case, and brought to power in the second case, Islamist regimes. Okay? It showed a White House tilt to Islamist regimes. Now, this was not an accident. There’s a lot of incompetence in this Administration, but this tilt is not an accident. People have mentioned John Brennan in many different circumstances, and they’re right to do so. I’m going to mention him in yet another circumstance. The speech he gave on the 26th of May 2010 at CSIS here in D.C. And I’m going to read you this quote because it should be cited in all of the accounts of the Obama Administration, all of the historical accounts of the Obama Administration. This is John Brennan, at the time the President’s Counterterrorism Advisor. He says, “The President’s strategy is absolutely clear about the threat we face. Our enemy is not terrorism because terrorism is but a tactic. Our enemy is not terror because terror is a state of mind, and as Americans we refuse to live in fear. Nor do we describe our enemy as jihadists or Islamists because”–get this–“Jihad is a holy struggle, a legitimate tenet of Islam, meaning to purify oneself or one’s community, and there is nothing holy, or legitimate, or Islamic about murdering innocent men, women, and children.” Okay. So, he’s advising the president every single day and this is what he says. Now, of course, it gets worse. The Director of National Intelligence, Lieutenant General James Clapper, is giving his annual threats briefing in the House right [as] Mubarak is heading for the door, and we see the Muslim Brotherhood coming in the front door. Mubarak’s going out the back. And he calls the Muslim Brotherhood, quote, “largely secular,” “largely secular.” Now, by the way Richard Engel, who’s an NBC News correspondent, he was on, he’s been on this week down on the Syrian border. He’s been in the region for many years. He understands these people. Well, he commented on NBC News that that was a stunning misrepresentation, a misunderstanding of the Muslim Brotherhood, okay. Now, of course it’s not as if Director Clapper had any idea what he was talking about. He was just repeating what he was getting from his analysts, okay? Now. One of those CIA analysts, a guy named Quintan Wiktorowicz, had been sent by the Counterterrorism Center for two years, 2009 to 2011, to London to learn about the British government’s deradicalization program. It’s a program called PREVENT. If any of you were at the Westminster Institute about ten days ago, Dr. Sebastian Gorka and Patrick Sookhdeo had avery detailed presentation about this, but I just want to give you a little idea about this. The British program was based on a notion that you should take young people who are at risk of becoming radicalized and working with Islamist groups, and send them to the mosque so that they can get more radicalized, and get deeper in touch with Islamist groups. And the idea is, according to them, and according to Quintan Wiktorowicz, is that there are good Islamists and there are bad Islamists, right? The good Islamists are the Salafis, the purists, the Imams who want to stay in the mosque but who don’t openly call for an armed struggle or a terrorist attack. And then you have the bad Islamists who are al Qaeda. So we’re really at war only with al Qaeda and not these other guys. Of course the problem, as Dr. Gorka and Sookhdeo point out, is that these two groups are really one and the same. They’re just two flavors of the same ideology, and the only difference between the so-called nonviolent Islamists that we are supporting–the Muslim Brotherhood and others–and the violent Islamists–al Qaeda–the only difference between them is timing and tactics. Timing and tactics. In other words, when to carry out the jihad. When to use violence to get the infidel–not whether or not they should do it, but when it’s appropriate. This guy, Quintan Wiktorowicz, rewrote our entire national counterterrorism strategy in August of 2011, where he essentially subjected all teaching of Islam–and Clare, I think you know quite a bit about this–to the FBI, to the Pentagon, to our special operators, and the rest. All teaching about Islam had to be cleared with the Muslim Brotherhood. So, of course we weren’t teaching our military, or our law enforcement people, any longer about the doctrines of Islamism, of Islam from Islamic texts because that would be inappropriate according to the Muslim Brotherhood. Wiktorowicz himself, this guy who now is at the White House. I forgot to tell you that. Okay, he goes to the London for two years. He brings back a bad program that is being shut down by the British because it’s been an abysmal failure. He comes back and is put in the White House in January of 2011, right at the beginning of the Arab Spring and now is advising Obama. He becomes the theorist of the White House. And even Wiktorowicz himself acknowledges that his notion of supporting the so-called “non-violent Islamist,” the political Islamists, the Muslim Brotherhood, against the others, has failed. And this is a quote from one of his own works. He says, “For reformed Salafis,” i.e., the purists, the guy that he wants us to champion, he says “there’s a great concern that the Muslim community is not ready to engage in jihad, either against incumbent Arab regimes or the United States. It is not that jihad is rejected as a tactic of religious transformation. Rather, reformists believe that several prior phases are necessary before jihad is permissible.” So he himself acknowledges, it’s all timing and tactics. And yet, what we did was that we supported the Muslim Brotherhood. We supported them in Egypt, we supported them in Libya, and the Benghazi attacks were carried out by organizations that were not even these purist Muslim Brotherhood types, but were directly linked to al Qaeda. Now, one more thing before I close. I would like to point out that this doctrine–that by the way is not just adopted by President Obama, but by Hillary Clinton as well–is of separating the jihadis from the proponents of political Islam, it’s getting people killed. And not just in Libya. It’s getting people killed in Afghanistan, where the United States claims to be supporting good Islamists–who now happen to be the Taliban, right–against bad style Islamists who also happen to be the Taliban. Go figure that out. This intellectual muck is getting Americans killed. It is intellectual muck. The inability of this Administration to tell the difference between friends and foes is as profound as it is dangerous. Friends you help; foes you defeat. That’s a concept as old as warfare itself, but this Administration seems to have stood it on its head by threatening traditional U.S. friends, such as Israel, and befriending our foes. So, I would just suggest to you that as we get deeper into the investigation of what actually happened at Benghazi, let’s not forget that the ultimate responsibility for this lies in political decisions by this Administration to support the very terrorists who kill our people. Thank you very much. ARONOFF: Let’s start off with our panel. Anyone have any questions for Ken, here, comments? RETIRED LT. COLONEL KENNETH BENWAY: Sure. 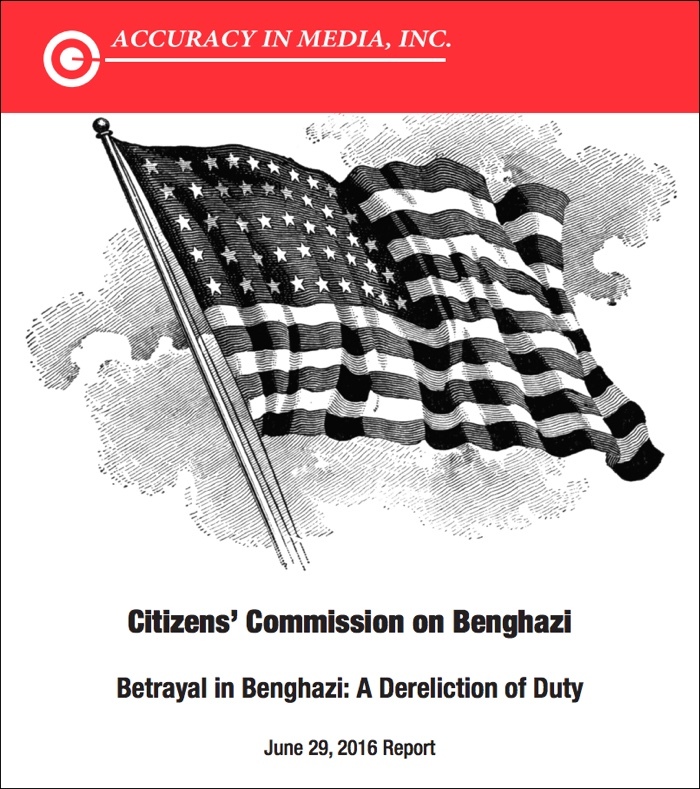 BENWAY: Ken, how long can this Benghazi level of interest continue here in America? TIMMERMAN: Well, I will tell you, first of all, there’s not much interest in the United States, as a rule. There are very rare Congressional hearings. There will be one this Thursday. But there’s very little interest. And the reason I gave you that joke about George Zimmerman, which is unfortunately very indicative of the mood in the news media is because they don’t want to cover it. They don’t want to cover it because they all know that the responsibilities lie with Hillary Clinton and Obama. What were they talking about at 10:00 pm in the evening on the night of September 11th, the famous phone call between Hillary and Obama? Well, we don’t know. Was that when the stand down order was given? Was that when the order to devise this ridiculous cover story about a demonstration, which everybody knew did not happen? It was an utter fabrication. Mr. Woods, you know from having seen the record now, and certainly Congressman Wolf knows, and Darrell Issa knows, there is not a single cable from Benghazi, from Tripoli, from any of our diplomats, talking about a demonstration over a movie–not one! There’s no evidence for it. It’s made up whole cloth. So, I think it’s a little bit up to us to gin up the popular support. Now, I have heard also in support of Mr. Boehner’s decision not to have a special committee is the notion that you can keep the story alive longer by having five separate committees investigate it. That’s the justification I’ve heard him use for his decision not to support it. I don’t particularly buy that. I think a special committee is the way to go, and it’s a special committee that needs to sit for a year, or 18 months–a little bit like the 9/11 Commission. Again, people died. Unlike Watergate, people died. LARRY WARD: I just want to confirm something you said. You had mentioned that the counterterrorism manual was rewritten and all mentions of Islam must be run through the Muslim Brotherhood? WARD: How come I’ve never heard of that? I mean, this is outrageous. TIMMERMAN: I lecture at the Joint Counterintelligence Training Academy down at Quantico to various members of the intelligence and law enforcement community, and some of my fellow lecturers have been pressured to change their presentations. They have to get their slides vetted ahead of time, and the vetting goes to advisors working for the Department of Homeland Security, or for the Defense Department, or for other agencies–and these advisors have been put in place by the Muslim Brotherhood. They are Administration-chosen advisors, but they are members of the Muslim Brotherhood in most cases. LYONS: I’ve written about that, but the one who is leading the pack on change all the training manuals, purging them, the trainers, was none other than the Joint Chiefs of Staff Chairman [Martin] Dempsey. And that tells you quite a bit of what you’ve got to know. BRAUER: –for teaching. And the surprising thing is he had wonderful officer efficiency reports, great feedback from the students, feedback from the students how great the course was, and he was told there were 57 Muslim organizations that protested, sent a letter to the Chairman, I believe, and that’s the end of that. That, as a former school commander, there goes your non-attribution, there goes every other instructor that might speak out and say something. And academic freedom is down the toilet. LYONS: The letter actually went to the National Security Advisor, Brennan. TIMMERMAN: Yes, and the important thing to note is that this is studying the enemy threat doctrine, okay? When you’re learning about Islamic law, and [Stephen] Coughlin was teaching Islamic law through Islamic texts, okay? Just like Major Hasan, remember? Major Hasan had this long Powerpoint which he had presented here, actually, on the East Coast, at a conference–I forget where it was–but it was an army psychologists’, I think at Walter Reed. And he went through all the reasons why the U.S. military should not be sending Muslim soldiers to Afghanistan because they could turn against the U.S. military. And he laid out all of the Islamic texts that supported, essentially, that kind of jihad inside the U.S. military–and we didn’t listen. And that’s been censored. So, [Stephen] Coughlin was doing the same sort of thing. He was taking the Islamic texts, authorized, authentic, recognized Islamic texts, and explaining the doctrines of jihad, and of war against the infidel. And they didn’t want to hear that any longer. So now we are war with violent extremism and, oh, by the way–going back to the gentleman’s question about the August 2011 counterterrorism doctrine. In the same sentence in that doctrine, Quintan Wiktorowicz wrote that Al Qaeda poses a threat to the national security of the United States of the same intensity and sort as the Sovereign Citizen Movement in the United States. I’m glad all of you are aware of the terrorist attacks by the Sovereign Citizen Movement. In fact, I’m glad all of you have heard of the Sovereign Citizen Movement. But, they are compared in the same sentence as posing the same threat to the United States as al Qaeda. CLIFF KINCAID: Ken, I’d like to pick your brain on Syria because that’s a topic that is in the news. We may have forgotten Benghazi, but it certainly looks like the Administration is supporting the same kinds of people in Syria that they supported in Libya. But in this case, and I want you to talk about this. You’ve been writing in the Daily Caller that this so-called intelligence information that’s being used and presented to, or parts of it, to members of the Congress to justify these threats against Libya, have actually been doctored and distorted, and that they do not show that Assad’s regime used chemical weapons. Where does the truth of that lie? TIMMERMAN: I asked that question to a senior Republican this past week, last week, who had taken part in the intelligence briefings, so he had seen the classified intelligence that the Administration presented, that proved Assad’s responsibility for the August 21st chemical weapons attack, and he just laughed. He said ‘It was manufactured intelligence.’ He said, ‘They created the intelligence.’ That was a stunning statement, an absolutely stunning statement, and this is not some fly-by-night individual. This is somebody who’s been in office for quite some time, who understands the intelligence community and the military very, very well. He said they had manufactured the intelligence. I would just make a couple very quick points about that. The three-page document that the Administration released claiming that this was their intelligence assessment. It started out, “The United States government assesses.” Now, I know many of you in this room have contributed to or certainly read NIEs–National Intelligence Estimates. A National Intelligence Estimate does not begin with the words “The United States government,” it begins [with] “the intelligence community assesses” or, simply, “we judge,” and it is backed up with the authority of all 16 agencies, intelligence agencies in this country, and by, in the past, the Director of National Intelligence, the Director of CIA, or, today, the Director of National Intelligence. And, when you have dissents, those dissents are also noted. So, I believe that the political document that the Administration put out was issued in that way because there were dissents, and I believe, my own sources tell me, that the military intelligence agencies did not agree with the assessment. And they didn’t want those dissents to be known. So this is a way of covering up the dissents, among other things. Did the rebels carry out the attack? I don’t know.But I would certainly like my government to tell me the truth and not to be presenting doctored intelligence, or to be making stuff up. RETIRED GENERAL THOMAS MCINERNEY: Ken, what do you think the UN document that’s supposed to come out today will say? TIMMERMAN: I’ve heard different reports about that from people who have seen various drafts. An early draft concluded that the sarin gas that was used in the attack was not military grade, which I think was obvious from the just, excuse me, just on the surface. Doctors Without Borders [speaking French] had examined 3,600 people who had been victims of the gas attack. 355 of the died. That’s about a 10% fatality rate. That is not the fatality rate of military-grade sarin. I just got, I was in Halabja this year for the 25th anniversary of Saddam Hussein’s poison gas attack on his Kurds, and Saddam used a cocktail of sarin and mustard gas. The survivors had been gassed with mustard gas. There weren’t any survivors who had been hit with sarin. Not a one. So, that may be censored out. It may also be censored out. Their evaluation of the rockets that were used, what is very interesting to me. There’s a source who I normally wouldn’t quote, a guy named Ted Postol at MIT. He’s a left-wing academic who hates missile defense, and he used to say in the 1980s, ‘Well, you can’t hit a bullet with a bullet, so we shouldn’t be doing missile defense.’ And of course, as it turned out, yes we can hit a bullet with a bullet, and missile defense is a very good thing to be doing. But nevertheless he examined not just the YouTube photography but some of the still photographs that came out of the scene of the exploded rockets. Okay, there were rocket fragments. And the photographs that he presented, and then the drawings, the reconstituted drawings of the rockets themselves showed a very unusually designed rocket with a kind of long tube like this full of propellant and around it something like almost like a water bottle on the top that contained the sarin gas. Well, guess what. That is exactly the same design of rocket that the rebels showed in one of their YouTube videos in, I think May or June showing a blue kind of bottle top that they had been filling with sarin gas showing that they had chemical weapons. We know that the rebels had taken over a chemical weapons depot in Aleppo on May 17th or May 19th. We know that they also seized a rocket depot that had these kind of rockets, from the regime. So, again, where’s the truth? I don’t know where the truth is, but I sure don’t like the fact that my government is not telling me that truth and that they’re making stuff up. MARIE CLAIRE KENDALL: Ask you a quick question in followup to that. I mean, it’s like this, it’s stunning to think that a lot of what you said, is was Assad, President Bashar Assad, told Charlie Rose. And so, and it’s in all the press. You had Drudge, the German newspaper talking about the intercept that caught Assad basically telling his generals do not use military weapons. So we’re in the position of having to believe Assad and Putin and not Obama. That’s just stunning. Can you comment? LYONS: Can I make a point? LYONS: For all those of you who are trying to figure why Benghazi has been left from the front pages of every media in the country, you’ve just witnessed it. Every new crisis moves it off the front page. You’re all focused on Syria here. We’ve got to get back to Benghazi. LYONS: What is it you don’t understand? LYONS: I mean, it’s pretty clear. KINCAID: To this group, yes. I’m talking about the American people who seem to have woken up to what’s happening in Syria, don’t want to get involved, and might be open to understanding, on that basis, what happened in Benghazi. TIMMERMAN: Yes, I think Cliff’s point is the same, it’s exactly the same operational operation in Syria today as there was in Benghazi. I want to hear from General Paul Vallely later on about the opposition because we are again, planning to arm the wrong side in yet another Arab civil war, just as we did in Libya. So, Benghazi is repeating itself in Syria. If we’ve got the media’s attention on Syria, take it, plunge that knife in, see if we can get some truth out about what’s going on in Syria and inevitably it will reflect back to Benghazi because the same thing is happening again. It’s exactly the same thing. By the way, leaking weapons, what your son was doing, I believe in Benghazi, was trying to round up some of the leaking weapons, MANPADs, surface-to-air missiles, and other things. Guess where those weapons headed? And by the way, another unanswered question is, was there a presidential finding to authorize the delivery of those weapons to begin with, first to Libya and then the retransfer of those weapons from Libya to Syria. I’m not convinced that there was a presidential finding, and if there was not, it would be interesting to get a constitutional scholar to make a determination whether that constitutes an impeachable offense. MCINERNEY: And trying to grasp and relate them will make our challenge more difficult. And so I think being able to keep the focus on Benghazi and to bring out these issues. We’ll better serve the public by doing that. MCINERNEY: Which is a similar pattern. TIMMERMAN: [Unintelligible] the focus of this Commission, I think you’re right. RETIRED LT. COLONEL DENNIS B. HANEY: If I may interject. Just want to emphasize General McInerney said and Admiral Lyons said. Purposely in an Administration any word at any time when they have one calamity [such as] Benghazi, will purposely move the interest of the nation onto calamity. HANEY: Yes, and in fact that they do that. They do that every time, and they do that on purpose. Waiting for the next calamity. No crisis is left behind in this Administration. TIMMERMAN: My name is Ben Ghazi. BENWAY: Just to your point Denny. ARONOFF: Moving right along. Go ahead. BENWAY: Just to comment on that, the distractions become more and more dangerous as we progress here. We’re getting into some pretty tough distractions with Syria. ARONOFF: Okay. Alright, well let’s stick to Benghazi.